You can hire bikes in the Charente with Bike Hire Direct! BikeHire Direct Charente make it easy for you to rent bikes in the Charente - there is no need to have the extra hassle of transporting your own bikes... let us know where you are staying and we will deliver bikes directly to your holiday accommodation ready for you to enjoy on your holiday! For more information visit the 'Contact Us' page to find out about hiring bikes with BikeHire Direct Charente! The gently rolling countryside is a patchwork of fields of bright sunflowers and rows of ripening vines dotted with impressive chateaux. The Charente river, which runs throughout the department, was described by both King Henry IV and King François I as “the most beautiful stream in France" ideal for a riverside bike ride with a visit to a local bistro for delicious food and amazing French atmosphere. As the Charente is the second ‘sunniest’ region in France with very low rainfall you can enjoy cycling without having to worry about bad weather! The EuroVelo network consists of 14 cycling routes stretching 70,000 km across Europe. EuroVelo 3, or the Pilgrims Route, crosses through the Charente. The entire route is just over 5122 km long and connects Trondheim in Norway to Saint Jacques de Compostela in Spain. The Pilgrims Route passes through the centre of the Charente region from the north of the region (from Poitiers) down to the south of the department where it heads towards Bordeaux. For further information visit the European Cyclist Federation. The Charente features over 1000 km of marked mountain bike trails helping you to discover the beautiful countryside of the region. The Mountain Bike routes vary from 6 km to 50 km in length, from 65m to 850m altitude and through a variety of difficulty levels which means that they are suitable for everyone from children up to the experienced off road cyclist! 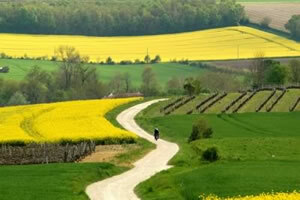 Voie Vertes are a network of ‘green routes’ crisscrossing the Charente. The routes can only be used by pedestrians, cyclists and horse riders ... all motorised vehicles are not allowed. The routes are therefore safe and ideal for use by families and those with young children.